A wooden number board with colourful numbers. This wooden number board comes with the numbers 0 to 9. The colourful wooden numbers are cut out of a massive and solid wooden plate. Each child will have fun with this wooden toy. While playing, your child will multiply, divide, solve additions and much more. 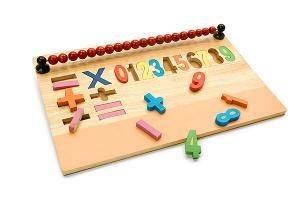 The colourful numbers make playing with this wooden toy even more fun! This wooden toy is hand made and produced out of sustainable and massive natural wood. This wooden toy is an ideal toy to play with and stimulates the development of the fine motor skills of your child. Each wooden number board is individually branded by the natural grains of the wood and the touch of the craftsman.